Our Kind of Cruelty: A Novel (Hardcover) | Fountain Bookstore, Inc. So creepy and good! This intrigued me initially because Gillian Flynn has a great blurb on the cover but I was drawn in immediately once I started reading. Mike and Verity used to be a hot and heavy couple but time and infidelity broke them up, much to Mike's dismay. To put it mildly, he takes the breakup hard and continues to email Verity to let her know how much he still loves her despite her lack of interest. Verity marries another and Mike takes that as a sign that she's still playing their old game, The Crave. Things take a violent turn and the former couple has to defend themselves against some shocking allegations. This hit home to me as a woman, as it really shows how women and men are treated differently in our justice system and how two people can have similar pasts yet be judged so vastly differently. Anyone with a jealous or abusive ex is going to be triggered and every female that reads this is going to feel a bit uncomfortable at the realities of being a woman in a man's world. 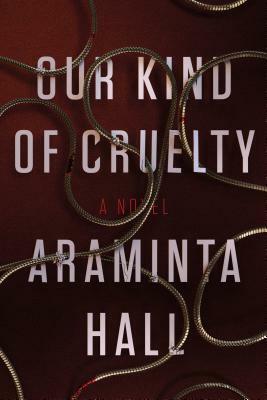 A spellbinding, darkly twisted novel about desire and obsession, and the complicated lines between truth and perception, Our Kind of Cruelty introduces Araminta Hall, a chilling new voice in psychological suspense. This is a love story. Mike’s love story. Mike Hayes fought his way out of a brutal childhood and into a quiet, if lonely, life before he met Verity Metcalf. V taught him about love, and in return, Mike has dedicated his life to making her happy. He’s found the perfect home, the perfect job; he’s sculpted himself into the physical ideal V has always wanted. He knows they’ll be blissfully happy together. It doesn’t matter that she hasn’t been returning his e-mails or phone calls. It doesn’t matter that she says she’s marrying Angus. It’s all just part of the secret game they used to play. If Mike watches V closely, he’ll see the signs. If he keeps track of her every move, he’ll know just when to come to her rescue . . .
Araminta Hall is the author of Everything and Nothing. She has an MA in creative writing and authorship from the University of Sussex, and teaches creative writing at New Writing South in Brighton, where she lives with her husband and three children. Our Kind of Cruelty is her first book published in the United States.